The word “Kaizen” is a combination of the words “kai” (change) en “zen” (for better), which makes “change for better”. The philosophy behind it is all about the act of continuous improvement. The term originally comes from the book Kaizen by Masaaki Imai, through which Kaizen was first introduced to the western world. Kaizen is widely known as a systematic approach for business improvement, but it actually refers to any improvement, one-time or continuous, large or small in all areas of life. So yes, it can also be applied to guitar practice, to hone, improve, and perfect our skill continuously every day. The improvement isn’t necessarily focused on large scale changes, and huge wins, but more on smaller, incremental and immediate changes. So, instead of thinking how to make a big, giant step towards becoming a brilliant guitar player, and start buying expensive guitars, equipment, and executing an extensive practice regimen, you focus on the smallest improvements you can make in your guitar playing right now. A continuous process that is less intimidating, doable, long lasting and definitely adding up. If you’re working on chord songs, start to OBSERVE your playing, listen to the sound quality of your chords, check carefully the positioning of your fingers, pay attention to the transition of your chord changes, and the steadiness of your rhythm playing. Now, how can you make really small and effective changes in each one of these areas to get better, immediate results? Look closely and patiently and try to make a slight correction, or a small adjustment. Don’t think too much ahead, Just take it step by step, and keep up this practice. You will soon notice the accumulated effect of all these micro-improvements. 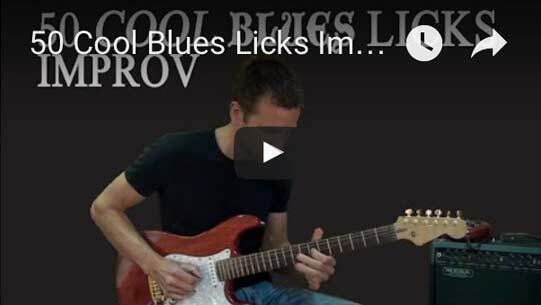 If you’re practicing solo/lead guitar try to look for the nuances in your playing. Are you playing your notes clean and clear? Work on the tiny things that make the biggest impact, like a good solid bend up, and a really nice vibrato. A quality vibrato makes all the difference in your playing. Work on creating sweet melody with few notes, instead of trying to cram every note in your vocabulary into a few bars. If you fire all your guns in the first minute you have no ammunition left. 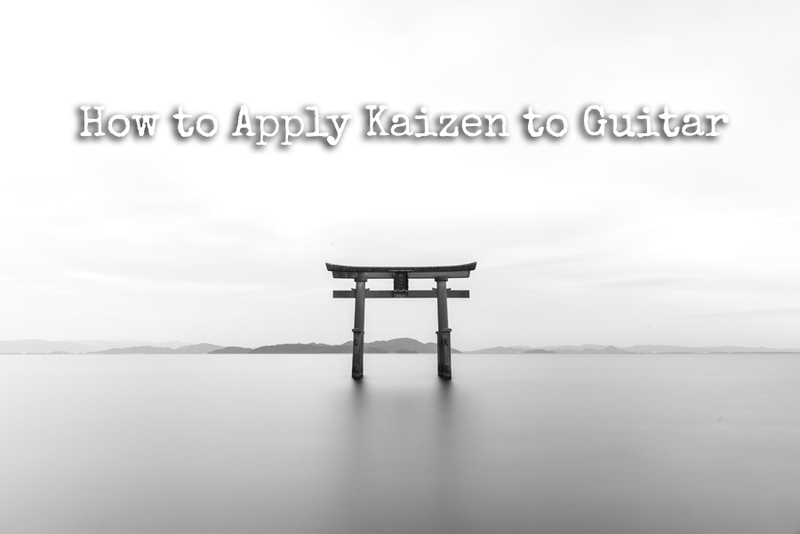 You could also apply Kaizen to your practice time, and schedule. The idea is to cultivate a habit with small continuous improvements that will grow into a regular steady practice workout. Start with a daily practice of 10 minutes. How could you trigger such an event and set up your day that would practically PULL you into your practice workout, so you don’t need to motivate yourself. Think of small and effective triggers continuously. CUT OUT TIME and schedule a fixed 10 min daily practice time. Put your practice time on your wall calendar, iPhone, computer, etc. Prepare your sheet music and put it in sight. THINK about such continuously micro improvements all the time throughout the day. APPLY such continuously micro improvements once a week, every two weeks or once a month. In every aspect of guitar playing focus on steady, gradual micro changes that will lead to significant changes in the short and longterm. The problem with going for big changes too fast, is that they don’t last when times suddenly get hectic, or something unexpected happens. Your big goals will crash fairly quickly and your motivation will fade away soon, which takes you back to square one. With Kaizen you only have to stick with each small micro gain you make which is much more sustainable. This is why Kaizen is a very effective, strong and long lasting approach. Now start building those micro improvements! I’m gonna try this approach. I really need to get myself a regular steady practice time. Thank you for this one. You always give such good advice. Kaizen for the guitar ; “schedule a fixed 10 min daily practice time.” Only 10 minutes a day of practice? What do you do with the guitar for the rest of the day? Hi Michael, Haha! Thanks for correcting my grammatical errors. I appreciate it. I learn as I go. For some it’s a challenge to practice daily, let alone 30 to 60 minute a day or more. That’s where Kaizen comes in. Small, incremental, continuous changes and improvements to build a solid foundation that lasts. If you are practicing solo or lead guitar then always try to look for the nuances in your playing. Always start working on small things that make the biggest impact. Kaizen is similar to the power of good habit meaning. Practicing guitar everyday is good habit to improve our guitar skills. It’s so interesting to know a Japanese word about it. Thanks for sharing! Perfection is only ever achieved via tiny improvements form what was the best. We see that in life every day. So working on small daily improvements to your guitar playing will guarantee that you become great. The challenge is to not give up before attaining greatness.